Thursday: Sun to clouds, mild. Highs betweeen 75-80 degrees. Overnight Thursday: Chance shower, fog, turning humid. Lows in the 60s. Friday: Humid, early shower, chance afternoon thunder. Highs around 80. A weak warm front over southern New England is generating patchy dense fog to start off today with temperatures mostly in the 50s. The warmest weather for this afternoon is across northern New England, as warm to hot air moves across southeastern Canada into northern Vermont, much of New Hampshire and northern Maine where we may hit 90 degrees in a few spots near the Canadian border. 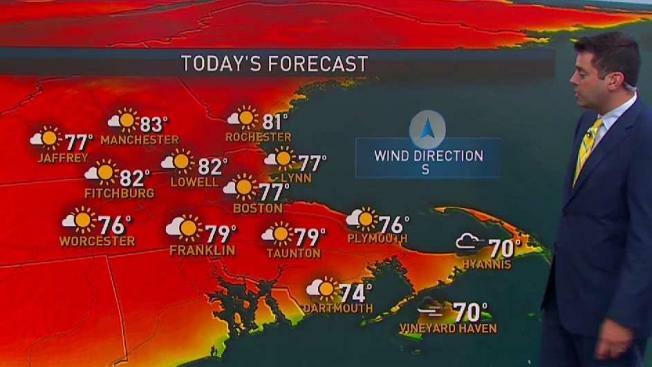 In southern New England, fog gives way to sunshine and clouds mixed with a possible shower, or a brief thunderstorm, especially along the south coast and in western sections. The high temperature will mostly be near 80 degrees but cooler near the coast with the onshore breeze. Slow-moving weather systems consisting of an old front, and the remnant of subtropical storm Alberto, will generate showers and thunderstorms mid-day tomorrow into the afternoon and overnight. It becomes much more humid with the high temperature again close to 80 degrees, and warmer as you head north. The front only slowly moves through tomorrow and into the weekend, with slow improvement for northern New England, but there's still a chance of showers for parts of southern and eastern New England. Temperatures will begin to cool, into the 70s on Saturday, and 60s on Sunday. There will be a new low-pressure system forming on the front over the ocean, but it remains to be seen if that will impact us with rain or not later Saturday into Sunday. If it does end up raining in southern New England, the temperature will only be in the 50s Sunday. It is still challenging forecast for the weekend, so stay tuned for further changes.